When you consider the origins of #IDARB – it began as a simple post on Twitter of a red box, the developers asking the public for ideas on what to do with it – the absurd nature of the game starts to make sense. It’s a local multiplayer game where two teams of up to four players each, consisting of themes like music instruments or arcade cabinets, compete for control of a ball to toss into their respective goal while contending with random events called “hashbombs,” which range from flooding the arena with water or causing spikes to sprout everywhere to turning off the lights and even rickrolls. It is a truly bizarre game, and one of the best reasons to own an Xbox One right now. 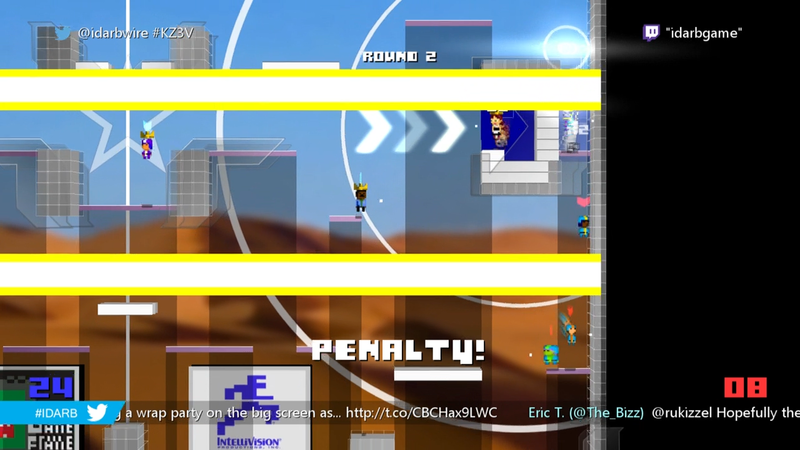 #IDARB is a game built around Twitter integration. A feed of tweets using the #IDARB hashtag constantly scroll across the bottom of the screen, serving as sort of faux newsreel. Each match has its own unique hashtag that allows anyone playing or spectating to wreak havoc on your specific game as long as they have the hashtag and use it in conjunction with a specific command (the aforementioned “hashbombs”), which summon a variety of ridiculous effects and temporary gameplay modifiers. They can also be used by typing them into the chat on a Twitch stream. A lot of them are purely dumb, visual fun, but some of them actively affect the flow of a match. Flooding the arena with water allows everyone to swim around freely, making it easier to chase the ball as well as throw it into the goalposts. Touching spikes will drop you in the penalty box for a few seconds, and the “clowns” command turns everyone in to clowns, removing any easily identifiable characteristics from your avatar, which, in my experience, always caused me to lose track of where I was – or more so than usual, anyway. And if that weren’t enough, there are also halftime shows that have you play a quick mini-game based off old Atari classics like Combat or arcade games like Track & Field, or something ridiculous involving the Kinect. The chaos is very much the appeal of #IDARB. Everything moves at blistering speeds as everyone scrambles to grab the ball, bouncing it all around the arena as everyone keeps knocking it out each other’s hands. Between all the flashing lights and cacophony of rectangles converging on the same spot, it’s a constant struggle to keep up with the action as everything swiftly devolves into utter bedlam. It’s easier to keep up with when playing with fewer people, which makes the game move at a more controlled pace, reining in the chaos and making it a more strategic – or at the very least tense game. One-on-one matches exemplify this by reducing #IDARB to its bare essentials. There’s a lot more quantifiable skill involved in such match-ups since you can actually hold onto the ball for more than a few seconds at a time, allowing you more time to prepare and attempt riskier throws. The further you throw the ball from, the more points your team earns if it lands in the goal. But #IDARB is at its best in full eight-player anarchy. The game becomes less about skillful play as it is a matter of seeing who can reach the ball and toss it into their respective goal fastest, but that’s also what makes it fun. The chaos makes it seem like a mess as a spectator, but when you’re in the midst of it, the action is surprisingly easy to follow. It’s difficult to get such a match going, however, since you need either eight controllers or at least three other people to join you locally to find another four-player team online, as matchmaking only pairs you with people who are playing with a similar number of people locally. So if you’re the only one playing, you’ll be matches solely in one-on-one games, whereas if you’ve got a second player with you, you’ll be matched with two-on-two games. No doubt this is to reduce potential latency from multiple sources, as even the slight hiccups I got during one online game were more than enough to be disruptive. Still, it’s worth the effort to get a full eight-player match going if at all possible. If nothing else, you can get a taste of the action via the single-player mode. #IDARB’s story serves as a fantastic introduction, easing you into the madness by steadily pitting you against progressively larger teams. It’s not a glorified tutorial, either, but a reasonably sized campaign. Each match begins with a brief dialog exchange that gives a thin veneer of a premise to justify why you’re competing against anything ranging from mimes, cops, breakfast food, monsters, and so on, all of which are equally fun and ridiculous. If there’s only one disappointment about #IDARB, it’s the lack of bots. I only have two Xbox One controllers, and as such am mostly limited to one-on-one matches. Would have been nice to be able to toss a few bots in the fill out the teams, especially since the AI proves itself as a more than capable opponent in the single-player mode. Even so, my time with #IDARB has been absolute blast. It’s use of Twitter integration is inventive and ridiculous in all the right ways, giving each match a fantastic element of unpredictability and general absurdity, and the online functionality ensures there’s always someone to play against, even if you don’t have anyone to play with locally. The revival of local multiplayer games has been a great trend, and if stuff like #IDARB will continue to be made because of it, then I hope it’ll continue for years to come.